News Flash! The first day of fall is September 22! That means it's time to start getting your fall plans in place. I'm all giddy because I do love pumpkin spice, wool plaid and the smell of fireplaces burning. My pinterest boards are full of great fall decorating ideas and fall-inspired recipes if you need a little help to get your ‘Fall on!'?? But first, check out the Magnolia and Oyster Shell Fall Wreath I put together to get fall going on in my home. I was challenged by Ariel at PMQ for Two to come up with a fall wreath that was outside of the box and shied away from the traditional orange and acorns. That wasn't a problem since I've been looking for ways to use my stash of oysters that I acquired for my recent Oyster Shell Clusters. And since I live in coastal North Carolina in ‘oyster territory' and September begins oyster season, I thought it was fitting to use oysters in my fall wreath. I also incorporated other local flora and fauna in my wreath with Spanish moss, magnolia leaves and magnolia seed pods. Pheasants are found in my area as well, so their feathers needed to make an appearance in my wreath. This was an easy wreath to make, and I'll give you a step by step to show you just how easy. Several of the links listed below are affiliate links. If you order these products, I will receive a very small commission on the sale; however, the cost to you does not change. For my full disclosure policy, see here. Magnolia Leaves. After going back and forth for way too long, I finally decided to use silk magnolia, despite the fact that I have all the magnolia leaves I could ever need within 20 feet of my front door. 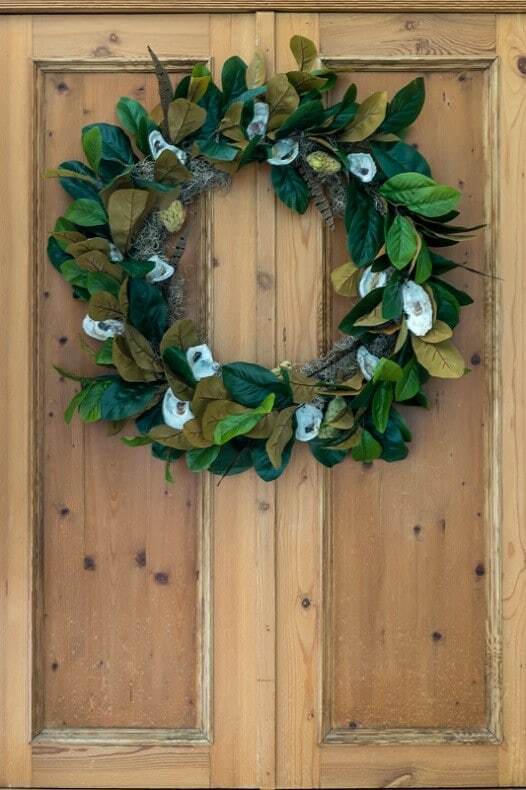 My decision to ‘go faux' was because I hope to use the base of the wreath several times a year and it'd be nice to have it done the next time I want to put a magnolia wreath on my door. I purchased 3 Ashland Magnolia Leaf Bushes at Michaels, which was just perfect for the 24″ wreath. Spanish Moss. I just went around the corner and pulled some off of a tree, but if you need to purchase it, you can find ithere. Oyster Shells. Try your local fish market and ask for their discarded shells. But…if you need to buy them, here is a link. Magnolia Seed Pod. Once again I was able to get these in my yard and I am shocked to learn that you cannot find them on Amazon! I think it's a first. But you can find them on Etsy. If you are using ‘fresh' Spanish moss, then put it in the oven at 250° for an hour to kill any chiggers that may have taken up residence in it. Because I was using the ‘faux' magnolia leaves, I cut the bush apart to have individual stems. Then I began taping the branches to wire frame. I attached the branches to the ring one in from the outside. I just went all the way around, having my branches all pointing in the same direction. Once all the leaves are on, it's time for the moss. Pull the moss so it is in long strings as opposed to clumps and begin wrapping it around the wire base, making sure not to wrap the leaves. I glued it in places on the back of the wreath to secure it. Drill holes in the oyster shells, near the hinge end. Then attach the oysters to the wire frame. Push a piece of wire through the magnolia seed pod and then wrap the wire around the stem and attach to the wire frame. Attach the feathers to the wreath, spacing as desired. I really like the way this wreath game together, with the natural, more muted colors of fall and the pops of white from the oyster shells. So, if you're starting to get your fall game plan set up, pin this fall wreath idea to your pinterest board for future reference. And…just because it's your lucky day…I've teamed up with 16 other bloggers who also showcased their fall wreath ideas, so…you really have no excuse. Just saying. Check them out! Thanks for stopping by to visit today, I appreciate more than you'll ever know. And when you leave a comment…ah, it makes my heart sing! So, if you'd like to get in on the ‘subscriber benefit' action, simply subscribe to Nourish and Nestle using the form on the right sidebar. It's towards the top a bit. I have sent all my subscribers the link to the Subscriber Benefits Library, but if you missed it or misplaced it, drop me a line. Thanks Ariel…and thanks for organizing us. So glad to have another use for my mountain of oyster shells. I never in a million years would have imagined using Oyster shells on a wreath. They are an amazing addition to the magnolia leaves. It’s so beautiful! Hey Kelli…if you have a mountain of oyster shells then you are looking for ways to use them…wreath? sure! Christmas decorations? sure! Halloween decorations? why not! Just joking…but…you never know. Thanks for swinging by today and leaving your kind comment. Lynn, I absolutely love this wreath and that you tied in all kinds of regional flair! The oysters are my favorite part of it, and it’s really cool to hear that oyster season is starting up. Hope you have a great holiday weekend! Hey there Robin… it was one of those kismet things since I had the oysters, truly just meant to be. Although I went faux magnolia, there is still a part of me that wishes I had used real leaves…but hen again, if I went real, there’d be a part of me that would say, ‘you should’ve gone faux’. That’s just how it is in my little brain world! Anyway, thanks for visiting today. This is so beautiful Lynn. Growing up in Georgia we had magnolia trees in our front yard and this reminds me of that those days. Good Morning Celeste! So good to see you here. I didn’t know you were a Georgia girl! Don’t you just love the magnificence of magnolias!? They are truly a lovely symbol of the south with their brilliant green leaves and oh-so fragrant blossoms. One of my favorite things about living in the South and I’d surely miss them if we move. Thanks for swinging by and wishing you a lovely day. Good Morning sweet Regina! I can always count on such kind words from you. Thanks for stopping by and I do hope your long weekend is fantastic! And I love the whales!!! And the flag of course. Oh, I love this unique combination of materials. It has a British Colonial feel to it. So romantic and eclectic! Hi Kathy..thanks! It is very reminiscent of Williamsburg…in fact that was my inspiration. I had seen oysters and other local flora and fauna in the wreaths in Williamsburg, Va when I visited there years ago. Thanks for coming by and wishing you a lovely weekend. Hi Lynn, What a beautiful wreath. I love the combination of magnolia and oyster shells. This wreath is stunning and could be enjoyed year round. Hey Tammy…thanks friend! My mom saw the wreath and fell in love with it, so now it’s hanging on her front door! But guess what that means…I get to make a new wreath! ? Oh, wow! 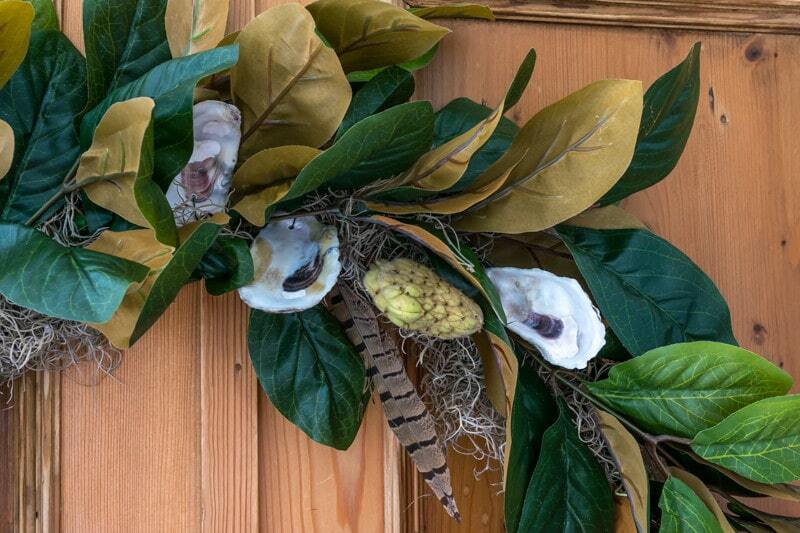 I would never have thought to add oyster shells to a wreath, but this combo is gorgeous. Thanks for sharing! Thanks Christina. As a diy-er yourself, you know how it is when you have ‘supplies’ lying around that you really want and need to use…Plus, I’m really loving oyster shells right now. Thanks for swinging by today and hope you have a great day. This wreath is lovely! The oyster shells just ‘make it’! I love this! I really like the addition of the oyster shells for a coastal feel! I am so glad you stopped by Celebrate and Decorate and gave me a heads up! Pinning this one! Hello Chloe, Thanks for stopping by today. And thanks for the compliment. I think I’ll be having quite a few ‘oyster’ projects coming up as I still have quite a pile of them. Wishing you a wonderful weekend. Hi Lynn, thanks for posting this! I also live in Wilmington, and just happened to find your post for the oyster cluster balls and then the wreath as I was doing a Google search for oyster shell crafts. My family is hosting a post-Thanksgiving oyster roast, and I was looking for ways to incorporate the oyster shells into some kind of decor. Great ideas! Hey Karen! My fellow Wilmingtonian! I am so glad you found me and that I was able to give you a few ideas. If you ever need more oyster shells, I was able to get mine at Seaview Crab on Carolina Beach Rd. Wishing you a wonderful Thanksgiving and post-Thanksgiving Oyster Roast. It turned out so pretty! Right up my alley! Oh, my fellow coastal dweller, it is right up your alley! Aren’t we lucky to have Magnolias and Oysters at our fingertips? Guess they make up for the mosquitos and humidity.